The aim of this work is to characterize the potential probiotic properties of 14 antifungal Lactobacillus strains isolated from traditional fermenting Moroccan green olives. The molecular identification of strains indicated that they are composed of five Lactobacillus brevis, two Lactobacillus pentosus, and seven Lactobacillus plantarum. In combination with bile (0.3%), all the strains showed survival rates (SRs) of 83.19–56.51% at pH 3, while 10 strains showed SRs of 31.67–64.44% at pH 2.5. All the strains demonstrated high tolerance to phenol (0.6%) and produced exopolysaccharides. The autoaggregation, hydrophobicity, antioxidant activities, and surface tension value ranges of the strains were 10.29–41.34%, 15.07–34.67%, 43.11–52.99%, and 36.23–40.27 mN/m, respectively. Bacterial cultures exhibited high antifungal activity against Penicillium sp. The cell-free supernatant (CFS) of the cultures showed important inhibition zones against Candida pelliculosa (18.2–24.85 mm), as well as an antibacterial effect against some gram-positive and gram-negative bacteria (10.1–14.1 mm). The neutralized cell-free supernatant of the cultures displayed considerable inhibitory activity against C. pelliculosa (11.2–16.4 mm). None of the strains showed acquired or horizontally transferable antibiotic resistance or mucin degradation or DNase, hemolytic, or gelatinase activities. 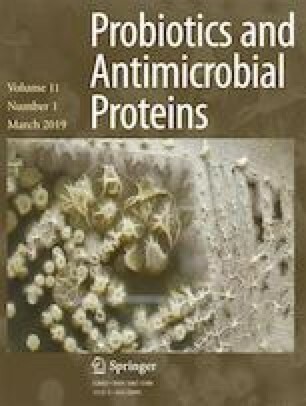 Lactobacillus brevis S82, Lactobacillus pentosus S75, and Lactobacillus plantarum S62 showed aminopeptidase, β-galactosidase, and β-glucosidase activities, while the other enzymes of API-ZYM were not detected. The results obtained revealed that the selected antifungal Lactobacillus strains are considered suitable candidates for use both as probiotic cultures for human consumption and for starters and as biopreservative cultures in agriculture, food, and pharmaceutical industries. The authors are grateful to the CNRST (PPR/19/2015), McGill University (Quebec), CNRST-CNR (Morocco-Italy), and Tunisian cooperation (17TM06) for their support.